Cycling is non-polluting and can help us breathe easier. Vitamin D generated from 15 minutes of sunshine a day can help prevent multiple cancers. Cycling strengthens the heart, which improves blood circulation. Cycling reduces the risk of arthritis, is gentler on joints than running and can actually strengthen them. It strengthens the large and small muscles of the back. Cycling burns calories and builds muscle. 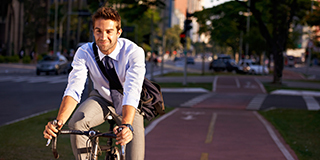 This entry was posted in All Blogs, CORE Wellness and tagged ACI Specialty Benefits, applebyte, bike to work, bike to work month, bike to work week, core wellness, corporate wellness, EAP, Employee Assistance, employee assistance programs, employee benefits, Top-Ten EAP, Wellness. Bookmark the permalink.